Welcome your new class with a fun counting book that could lead to some mathematical manipulation – and a spot of mayhem! 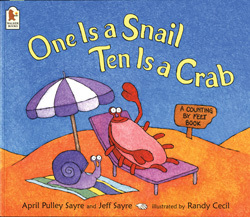 One Is a Snail Ten Is a Crab by April Pulley Sayre and Jeff Sayre, illustrated by Randy Cecil (Walker Books, ISBN 1844281647), is the ideal book for playing with numbers. Ask the children to predict what is coming next and they will be delighted when they are proved wrong! The book is great fun and, if used at the start of the school year, it will help you to gauge how comfortable the children are with manipulating numbers. Use the book for counting, recognising odd and even numbers, estimating and early multiplication. Since one is a snail and two is a person, we must be counting by feet! Using a dog for four, an insect for six, a spider for eight and a crab for ten, counting from one to 100 provides some very funny pictures to enjoy and helps children think about numbers.